Last September Benedict was called “The Man of the Festival!”. 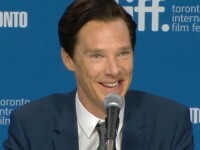 Joining the TIFF for the first time, Benedict inspired visitors and fans as well as the whole film world. The Fifth Estate, his amazing portayal of Julian Assange, was even the opener film at last years festival. This year, again, Benedict is going to rock the TIFF: The Imitation Game, long awaited biopic about the British computer genius Alan Turing, will have its world premiere. The European premiere will take place on October 8 in London, the German opening date will be 19 February 2015. The Toronto Film Festival takes place from 4 to 14 September, 2014.